It's not too often that I read nearly an entire novel in one day. This book was just so unbelievably pleasant in every way and it turns into one of those books that you keep thinking about even when you've put it down to shower or eat and you have to pick it right back up when you're finished! Our main character is Quinn, gay, about to turn seventeen and has all the characteristics of a seventeen year old; however, there is a terrible tragedy in his family that takes place just before the novel starts that makes Quinn not your average seventeen year-old boy. All together, this is a pleasant little YA novel that is about our friend Quinn finding himself again, learning that not all of our heroes turn out to be heroes, and not everything is always as bad as it seems. From the award-winning author of Five, Six, Seven, Nate! and Better Nate Than Ever comes “a Holden Caulfield for a new generation” (Kirkus Reviews, starred review). Quinn Roberts is a sixteen-year-old smart aleck and Hollywood hopeful whose only worry used to be writing convincing dialogue for the movies he made with his sister Annabeth. Of course, that was all before—before Quinn stopped going to school, before his mom started sleeping on the sofa…and before the car accident that changed everything. Enter: Geoff, Quinn’s best friend who insists it’s time that Quinn came out—at least from hibernation. One haircut later, Geoff drags Quinn to his first college party, where instead of nursing his pain, he meets a guy—okay, a hot guy—and falls, hard. What follows is an upside-down week in which Quinn begins imagining his future as a screenplay that might actually have a happily-ever-after ending—if, that is, he can finally step back into the starring role of his own life story. "The Great American Whatever knocked me out. 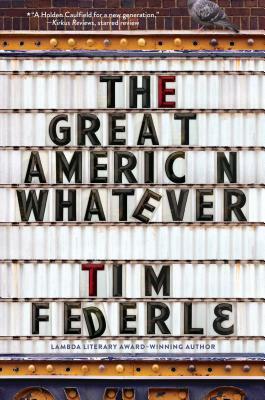 Tim Federle writes with a rare voice — original, authentic, engaging." "A raw nerve of a book—so perfectly tender and funny and true. My heart now belongs to The Great American Whatever. Officially. Completely." *"Federle’s first foray into YA is an accomplished effort, dramatic and distinguished by carefully developed, appealing characters... whimsical, wry, and unfailingly funny." *"A Holden Caulfield for a new generation." "The mix of vulnerability, effervescence, and quick wit in Quinn’s narration will instantly endear him to readers." *“Even under the weight of grief, Quinn’s conversational and charming narrative voice effervesces, mixing humor and vulnerability in typical Federle style." "Recommended for mature teens who want to be inspired." "Federle’s YA debut takes its place in the lineage of Stephen Chbosky’s The Perks of Being a Wallflower and John Green’s coming-of-age tales." *"What sets this fantastic novel apart is Quinn's brilliantly realized, often hilarious first-person voice, from laugh-out-loud asides to heart-wrenching admissions...Charming and imaginative."